It seems like every Tuesday there is a fun, new indie title that hits the Playstation Vita. Last week was especially fruitful, as it brought about the strategy RPG, Rainbow Moon, and Stick It to The Man!, a bizarre and oftentimes hilarious adventure from Ripstone. In the aptly titled Stick It to The Man!, you play as Ray Doewood, a hard hat tester who gets knocked into a coma thanks to a freak accident. His world is turned upside down when he awakens to find a large, 16-foot pink spaghetti arm sticking out of his head. To make matters even stranger, his newfound appendage allows Ray to read people’s minds. This new talent becomes especially useful when Ray finds himself on the run from a mysterious chain-smoking figure known only as The Man. It’s your job to “stick it” to The Man while also saving your girlfriend from his evil clutches. With dialogue penned by Adventure Time writer, Ryan North, the game’s wacky storyline never ceases to amuse. During my playthrough, I ran across all sorts of people — a pregnant man, a zombie jazz band, a woman with a white teeth fetish, and even Santa Claus himself. Best of all, every single one of these characters can have their minds read. In the creative world of Stick It to The Man!, anything seems possible. 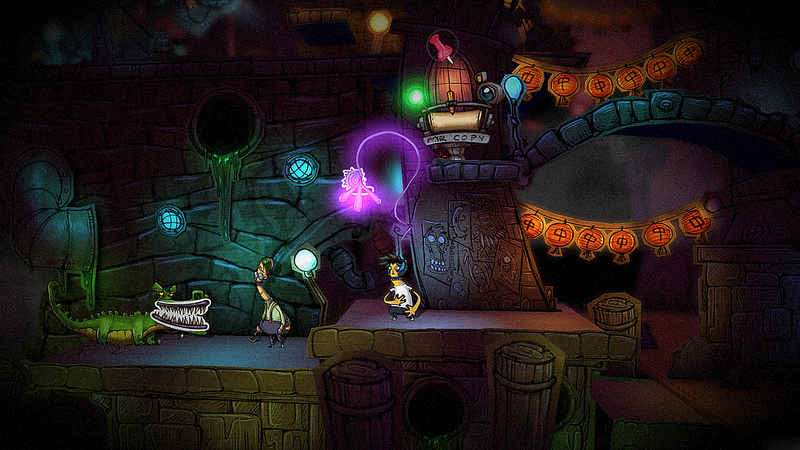 The gameplay is a mix of platforming and point-and-click adventure. The platforming parts aren’t all that difficult, although there are a few tricky bits where Ray has to swing past enemies (usually The Man’s henchmen) in order to get to the next area. The adventure elements come into play when Ray needs to use his pink spaghetti arm. The Vita version takes advantage of the system’s touch controls by allowing you to physically touch the areas where you want to use this arm. This is much easier than using the right analog stick, especially since you will be using Ray’s spaghetti arm quite a bit. Each of the game’s ten chapters are loaded with puzzles, most of which require some sly mind reading to solve. Occasionally, after hearing someone’s thoughts, a sticker will pop up in their thought bubble. Ray can then grab this sticker with his giant arm and apply it somewhere else that might make sense. 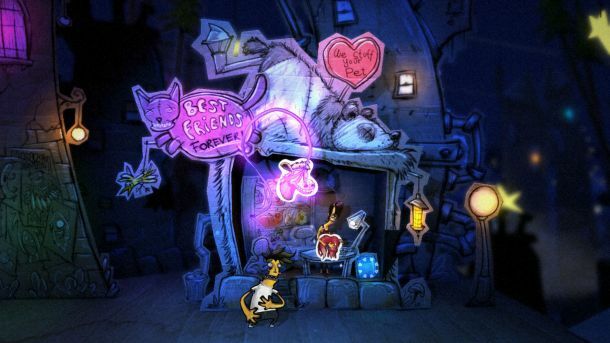 Certain buildings and other parts of the screen can also be pulled back (again by using the touch screen), revealing more characters and objects that can be used to solve puzzles. The solutions aren’t immediately obvious, especially since so much of the game’s demeanor is offbeat with seemingly random situations, but they do make sense in the end. There is also a helpful map that points out possible areas of interest, thereby lowering the chances of getting stuck. There were still a few areas where I was seriously scratching my head as to what to do, but a little bit of trial-and-error was usually enough to get me by. One area where Stick It to The Man! really excels is its overall presentation. The world is set in a beautiful 2D paper environment that has an almost Burton-esque aesthetic. On the audio side, a great deal of attention was put into the voice acting — every single one of the 100+ characters has their own dialogue, all of which is well done. The game’s snazzy jazz soundtrack is also a good fit for the overall style, as is the title screen’s inclusion of the 60s psychedelic jam, “Just Dropped In (To See What Condition My Condition Was In)“. Now, for all of its positives, there are a couple of minor issues worth noting. For one, on the Vita’s smaller screen it can be occasionally difficult to see the small white outline where a sticker can be placed. There were times where I would waltz right on past an object that I could have used to solve a puzzle, unbeknownst to me. I also noticed some sporadic drops in audio, where the dialogue would cut out for a split second, thereby creating a slight delay. Hardly anything game-breaking, but issues nonetheless. Since Stick It to The Man! is a cross-buy title, one purchase nets both the Vita and PS3 versions. For fans of adventure titles or just quirky humor in general, this is well worth a look. The 5-6 hour campaign is the perfect length for a title of this nature, and it’s quite easy to pick up and play. There really isn’t anything like it on the Playstation Network.